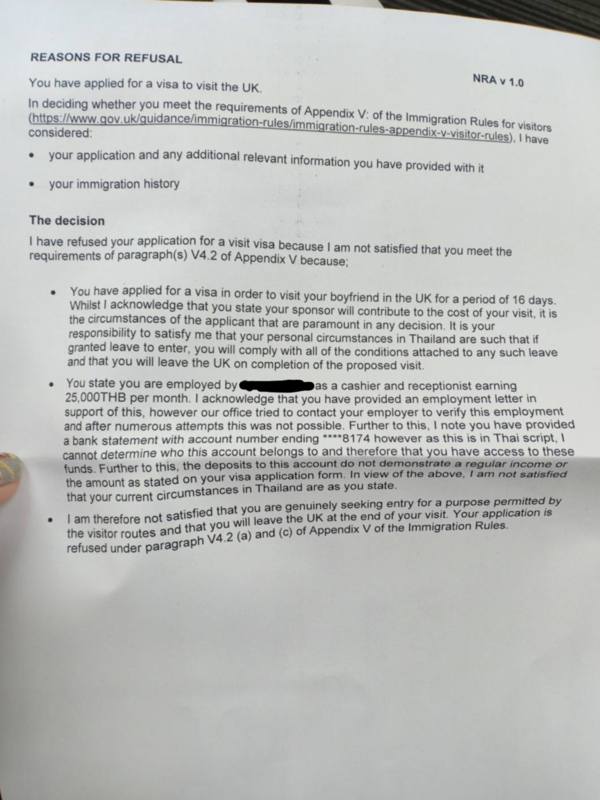 I just opened a refusal letter for my Thai GF to visit UK. Just looking for assistance on what i can do in my 2nd attempt. 1. Not sure what more i can do. 5 years of strong relationship proof. But she has no kids. No land or assets. 2. Not much i can do but provide another number and notify her manager to anticipate a call. 3. She works in a bar/hotel and earns 25k as a cashier/receptionist. Gets paid in cash. And deposits into account when she can be bothered... should i even provide her bank statement as i will be sponsoring her? Thought it might be worthwhile as she has 70k in there but omitting it next time may avoid questions?? 4. My fault. Should of had it translated. Can i apply again immediately? Yes, she can re-apply immediately but she needs to fully address the reasons in her refusal, and submit a strong case, otherwise she will be refused again. It would be helpful if your girlfriend could post her refusal letter, with her personal details redacted, I'm afraid that your bullet points aren't really enough to go on. Maybe she should say in her covering letter that the hotel/bar is busy and sometimes calls are unanswered, not sure that I'd really be convinced by that arguement though, but it's worth a try, as you say maybe she should encourage the hotel staff to be a little more on the ball during Embassy office hours after she's resubmitted her application. As to your points regarding her first application, how did she demonstrate your relationship previously, do you live in Thailand or the UK? There's more to her bank statement than confirming her income, if the cash you give her for the trip, and maybe more is what she relies on, what incentive is there for her to return? She really needs to demonstrate her ties here, she might not own property but she must live somewhere, did she provide details of her accomodation here? Not being bothered to bank her salary isn't really a good answer, she needs to be bothered. We really need to see the redacted letter. Had a similar problem as self employed wife never banks income such as it is. What I did was to get a letter from my MP supporting the application, surprised when it worked so might be worth a try. We attached her apartment bill, she rents. I have attached the refusal letter. You can pay for a faster process with the visa agency in Chiang Mai or Bangkok, won't change the outcome though. As for the bank statement, she can ask for one in English, my wife's bank Kasikorn supply her with one, no problem. What did the letter contain if you don't mind sharing some details. Difference is you state your wife he states his girlfriend there is a big difference big issue as I see it is she is paid in cash my friend was turned down 4 times but in the end he married her and a year later she was given her visa. Had similar problems. Refused for nonsense reasons like no money despite her having over a million bht in her account, can’t afford return flight ticket etc. Have lost interest in applying that much so now will apply in few years for third and last time to go on holiday to uk ! Several people I know with zero money , jobs and few months in a relationship got visas using the same agency in bkk first time of applying ! Although it cost them a bit for using the agency . Two of the reason for our refusal was I. I went to Thailand 3 times a year so why did she need to go to the UK. 2. Similar one, I was retiring soon to live in Thailand so why the need for her to visit me. Not much we could do about those 'reasons'. They actually tried to press a settlement visa on her at one time, they were about £400 back then. The other side of the logic is that it has little to do with you and your ability to guarantee, and everything to do with whether or not it is worth her while to return... if she could make 2x the salary in Britain as a maid, why would she return? That is the real question that needs to be answered.. The refusal letter is clear. It's not the lack of funds as such, it's because they are not satisfied her job is genuine. The bank statement in Thai script could be for anyone. It is essential that they can speak with her employer if she reapplies. Get the personal mobile number for her boss. Whilst I don't doubt that your MP wrote the the UKVI, or whatever it was called then, but I can assure that it would have little or no impact on the application. The only time a letter from a MP may sway a decision is if the original decision fell outside of the Immigration Rules in force at that time. So what is the best statement to convince them that she will return to Thailand ? My lady was refused 4 years ago and I have not applied again but now reconsidering it however reading events like this are discouraging . Our refusal ? similar reasons to the posters . All despite my lady has her own house and business ( all cash from her restaurant ) plus takes care of her elderly mother . So nothing has changed since the last application and I fear a second refusal . Very annoying when the UK seems to admit masses of immigrants and does not allow a UK resident to have his partner a tourist visa . If Thailand applied the same rules to UK tourists to Thailand there would be repercussions . Not level playing fields for sure . Read somewhere that it was best not to mention her boyfriend at all in the application and only the places of interest to be visited . Also if to be part of an organised tour to the UK is more likely to succeed .